Mar. 25, 2017. 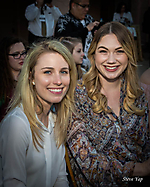 As part of Phoenix Fashion Week, Spring Into Style at Jokake Inn at The Phoenician is a community-driven event that showcased top Arizona stylists via six runway shows, each highlighting 2017 seasonal trends from local retailers and designers. The program also included pop-up shops and beauty product samplings, as well as live music.